NAPA Auto Parts has an outstanding reputation as the manufacturer of quality replacement parts for vehicles. They have built a solid business in the wholesale automotive parts industry and are steadily increasing their foothold in the retail market. 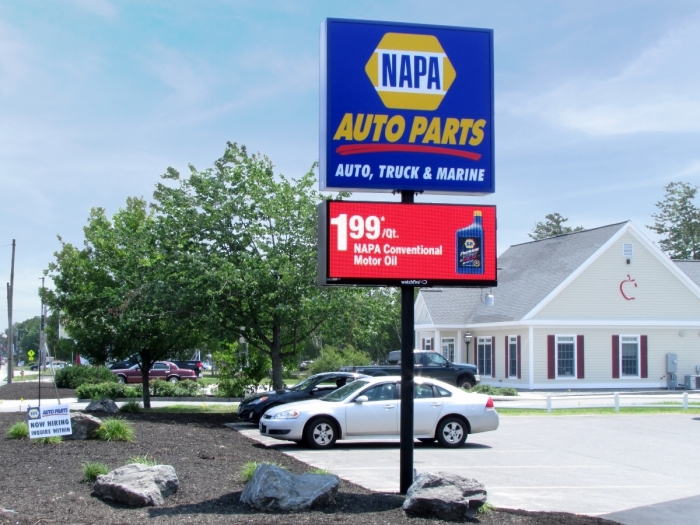 For NAPA stores in Maine and New Hampshire, the importance of distinguishing their locations as retailers became important within an overall corporate strategy to boost the NAPA brand among general consumers of auto parts. Steve Milton, District Manager with NAPA Auto Parts of Maine and New Hampshire says that is precisely why he utilizes the advertising power of digital signs at all of his region’s corporate locations. “Every time we refurbish, relocate or build a store, I replace the old signage with digital,” said Milton. Milton prefers the Watchfire’s flexibility and responsiveness. “We can run several messages each day, mirroring corporate promotions,” said Milton. NAPA works with a local advertising company to create ads and bring in content produced by Watchfire as part of their national corporate program. This allows the managers of each store to focus on other areas, like training for their counter staff in the promotion of daily specials to retail customers.